TheFoodRoots.com: The Holidays are Here!!!! Ok, so where is the gingerbread mans foot? Everyone knows that food pictures are supposed to be perfect- you've heard the lengths the industry goes to (glue for milk to look thick...) Well I am a baker not a professional photographer, and my dear husband just doesn't always have time to help me. Well this time of year like everyone else I've been shopping, wrapping presents, getting our Christmas card together. And I have been very busy baking. I didn't take the time to take a pic of my cute gingerbread men & St. Nicholas's until after the market was over and my poor leftover guys had been ridden around in the truck, and exposed to 80˚ Mississippi December weather. So his foot fell off and who could blame him. I promise if you come to see me at the market I will sell you an intact gingerbread man or St. Nicholas. And I'll try to get some pictures of St. Nicholas up too! They are very cute, for more information about fun St. Nicholas activities I found this website: www.thestnicholascenter.org. My yummy & cute gingerbread men are made from whole wheat & whole oat flour, without refined sweeteners except for the icing. 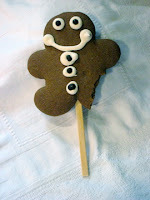 They are as healthy as I could get gingerbread men and are kid tested & approved (adults like them too! ).